My eyes were not deceiving me; there really was a chipmunk in our backyard this morning. While this discovery is probably not an oddity to most of you, it is to me! I have never, ever, in my whole lifetime, seen a chipmunk in my backyard or anywhere near my community. 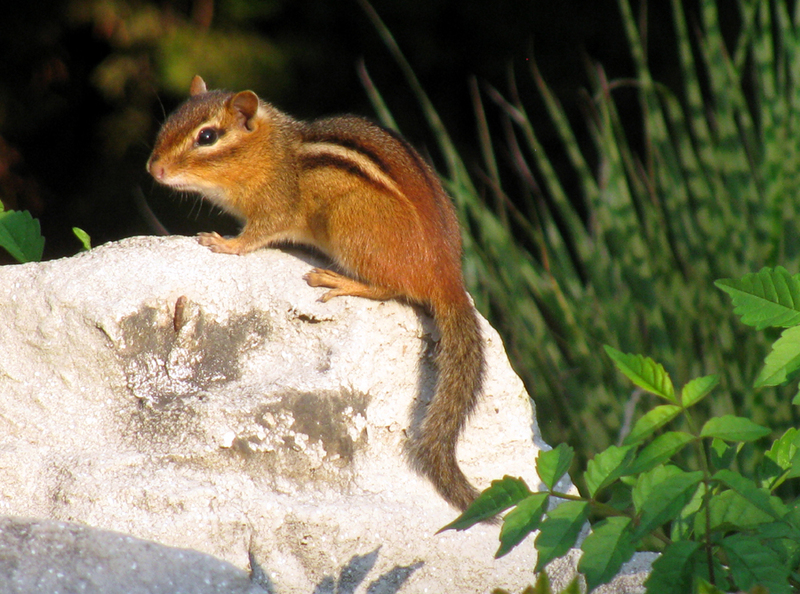 Ever since I was a little girl, I have had a fascination with chipmunks. I always thought chipmunks were the cutest things. I would sit in my bedroom at my white, child-size desk and draw pictures of two animals: owls and chipmunks. 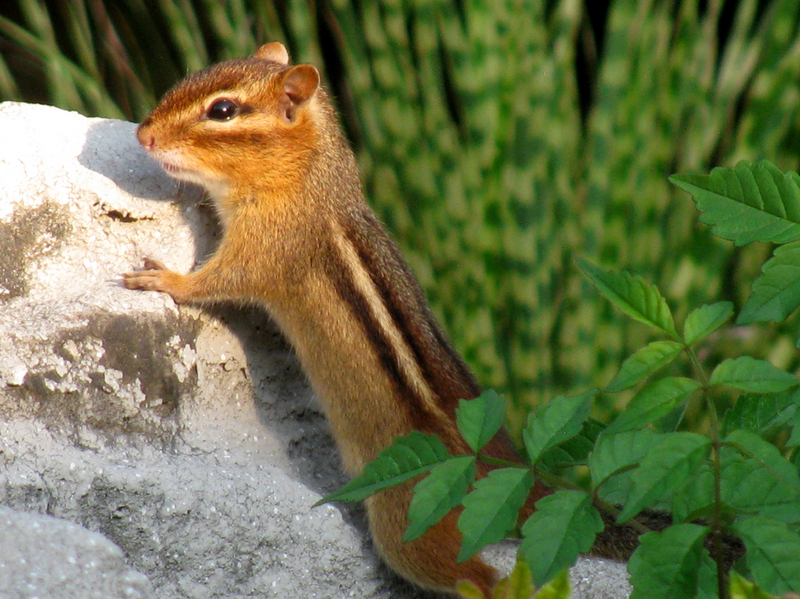 Unless you count the time I had my photo taken with Chip and Dale at Disney World, there were only a few opportunities for me to see chipmunks in person: on camping trips, hiking in the woods, or when visiting someone who lived in a wooded area. Only time will tell if today’s striped surprise will be a one-time visitor, like the white parakeet who visited our backyard. 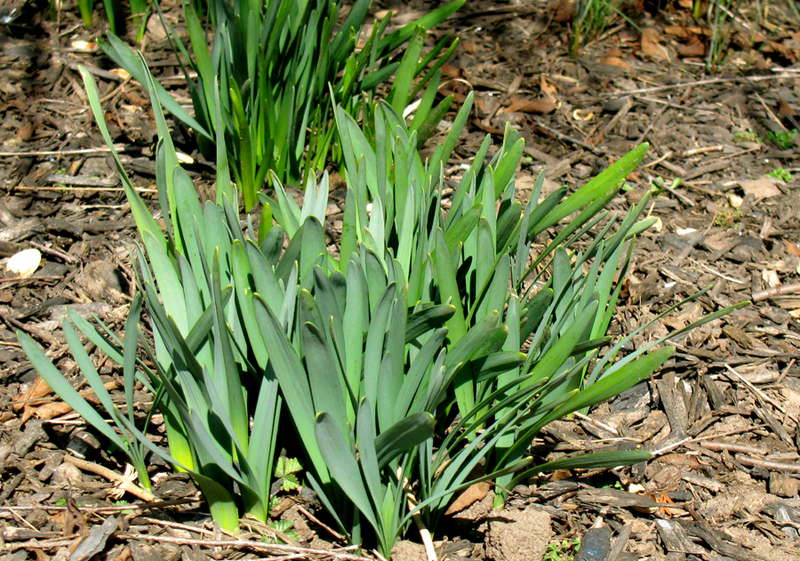 Maybe a chipmunk family will permanently locate here. 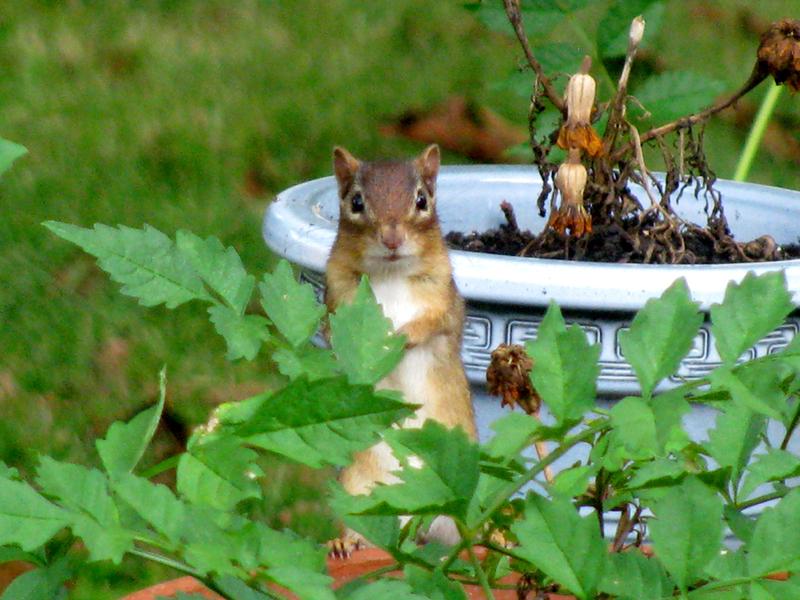 Regardless, I was delighted by this morning’s backyard chipmunk surprise. 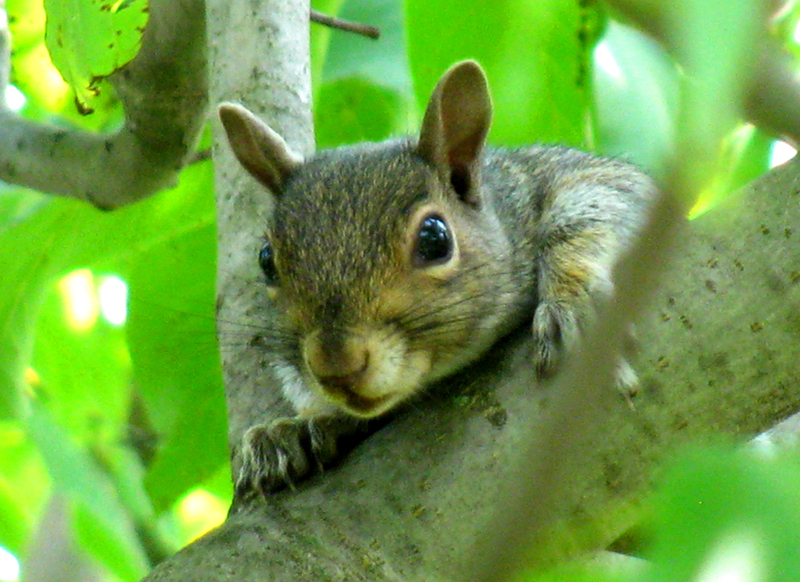 This squirrel likes to get comfortable and hang out in the tree branches. 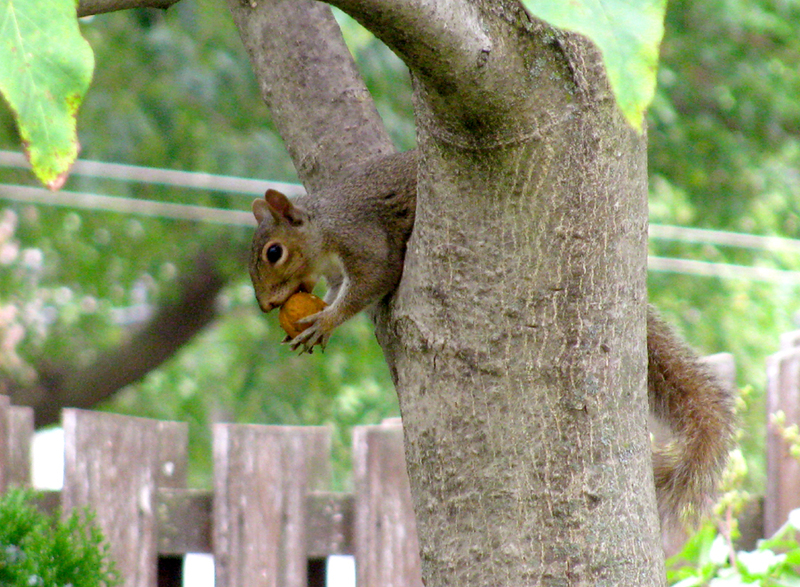 Why bother storing the nut for the future when you can have immediate squirrel gratification? 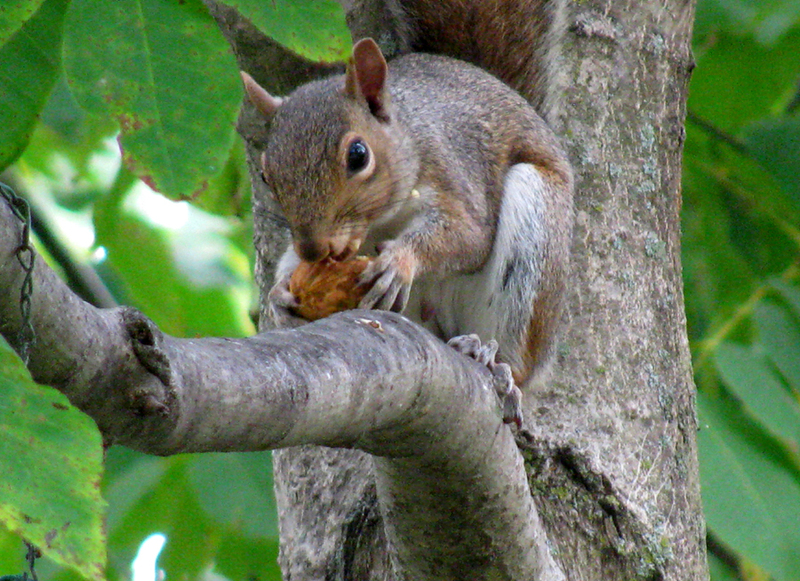 I’ve always thought that squirrels were industrious animals. 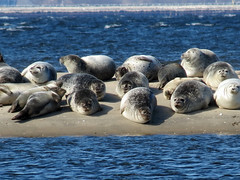 They seem active most of the time as they scamper around searching for food. I’ve seen them running along telephone wires like a gymnast on a balance beam, or scouting out the yard for secret locations to bury a cache. When acorns appear on the oak tree, the squirrels are ready, running up and down the tree trunk to carry away their treasures for a future meal. 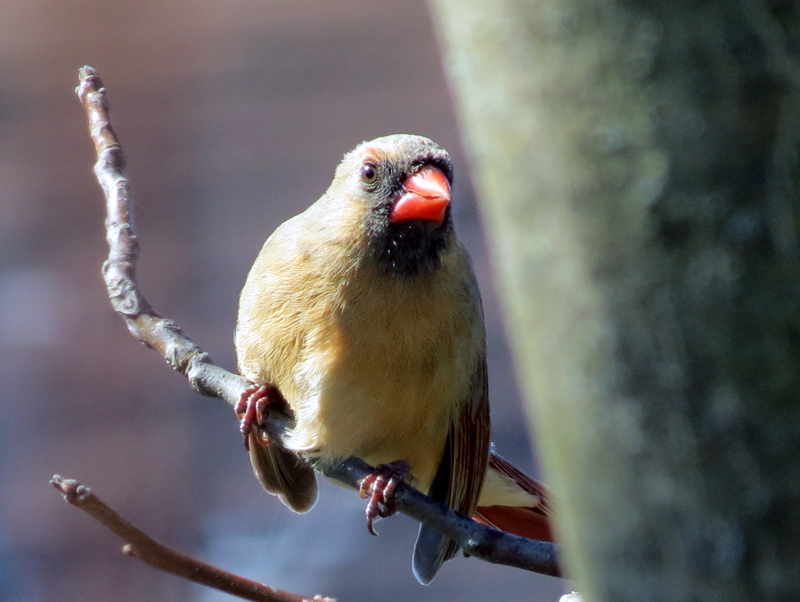 When the bird feeder is filled, they become contortionists in an effort to reach the seeds. The time has come, however, for the stereotype of the active, industrious squirrel to be broken. I have finally met a lazy squirrel! Our backyard squirrel likes to sit in the tree and watch the world go by. A branch shaped like a “V” becomes his lawn chair. 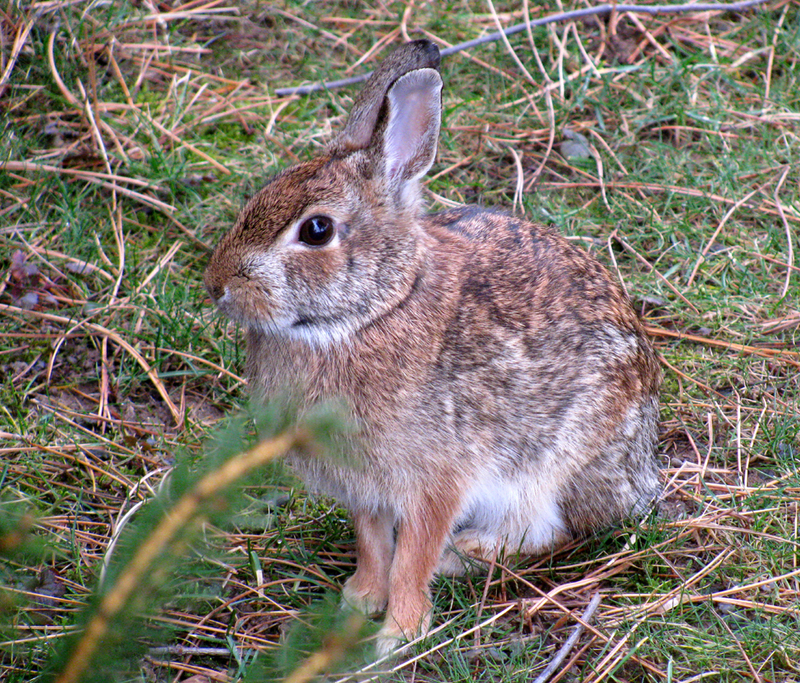 Instead of carrying food away to store in a cache, he eats it right away. No planning for the future, just immediate gratification. He doesn’t eat quickly either; he takes his time, savoring the flavor. You have to wonder if this squirrel will change his behavior once cooler weather approaches in the fall. For now, this un-stereotypical squirrel likes to sit, eat, and be lazy. I’ve always admired the resourcefulness of birds when it comes to building their nests. 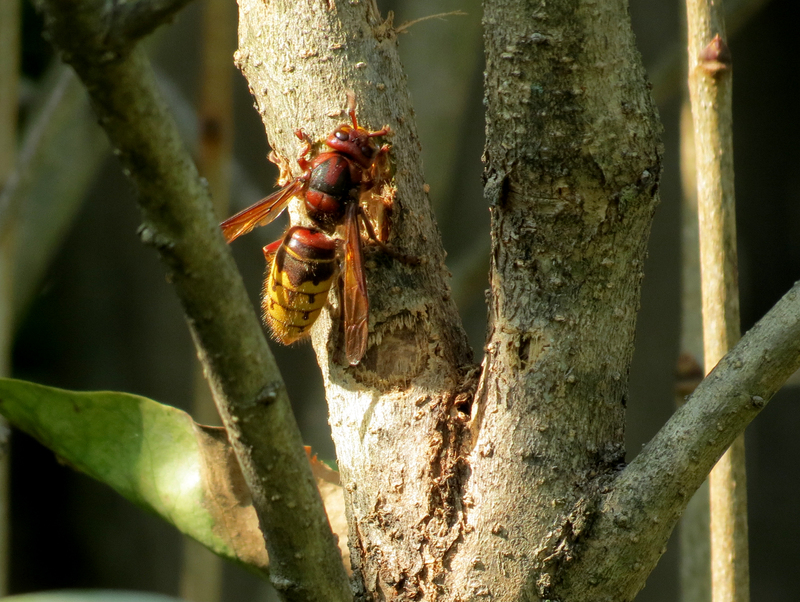 They flit around searching for nest-building materials just like people who scour yard sales looking for the perfect treasure. Leaves, sticks, grasses, as well as manmade castaways such as plastic bags, string, and bits of fabric are some of the chosen materials. 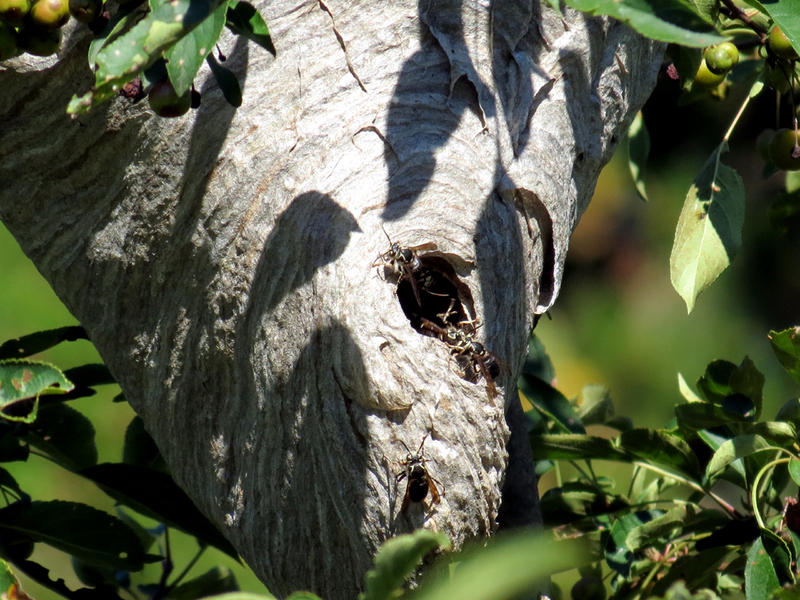 Back in the “old” days, sometimes you’d see strands of tape from an audio cassette hanging out from a woven nest. Several times I’ve noticed birds nesting inside the horizontal pole that suspends a traffic light or road sign over a highway. The birds fly in and out of the pole through a small hole that was probably pre-drilled for mounting purposes but never used. It can’t be very quiet in there, but it must detract predators. During a storm a few years ago, the plastic end cap blew off our portable basketball net. This created an opening at the top of the vertical pole. A tufted titmouse family decided to build a nest inside. 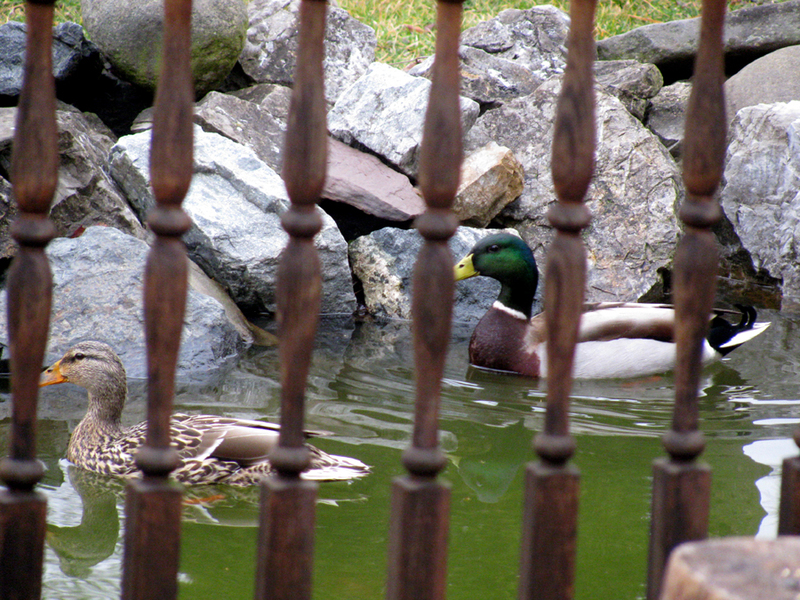 We never knew their secret spot until the babies got hungry and the chirping began in earnest. We were forced to curtail our hoops playing for a few weeks. One spring, a robin nested inside a potted plant hanging from our awning. Unfortunately, the bird family was disturbed every time we went in or out of the front door. The location of the nest did give us a great view of the eggs and babies though. More scholarly birds prefer the comfort of the alphabet as a nest site. I’ve seen nests tucked away inside the open crooks of three dimensional letters that are part of an outdoor sign, like the inside of the letter “O” in the word “STORE” mounted to the front of a building. 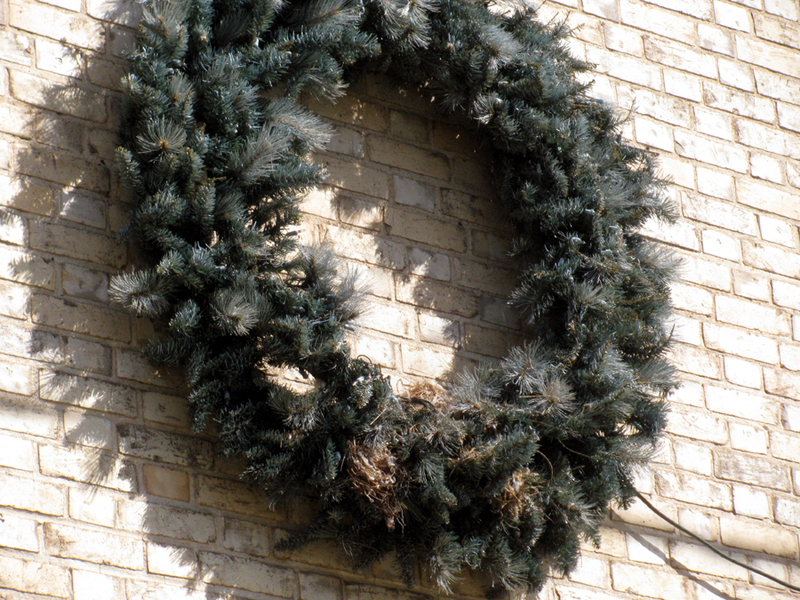 Last week, I saw an active bird’s nest at the bottom of an artificial, oversized Christmas wreath that had never been taken down from the side of an apartment building after the holiday season. The birds wove their nest right into the plastic branches. 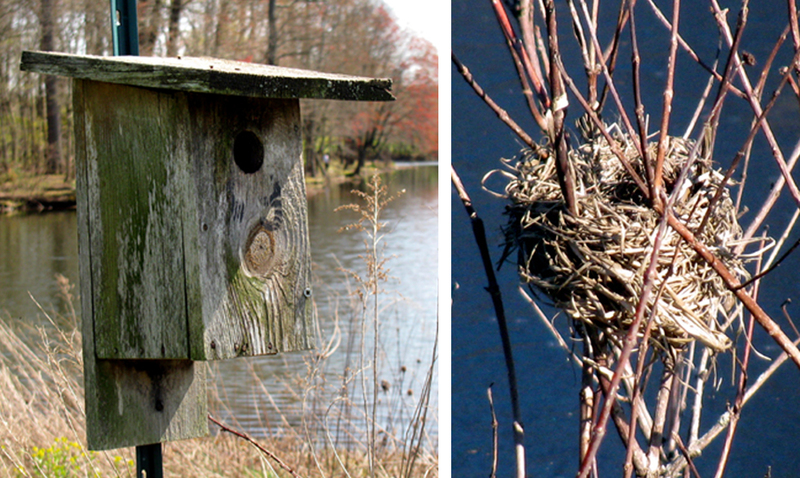 There seems to be an endless variety of places birds build their nests. I’d love to hear about the unique locations where you’ve spotted a bird’s nest. Please leave a reply below. 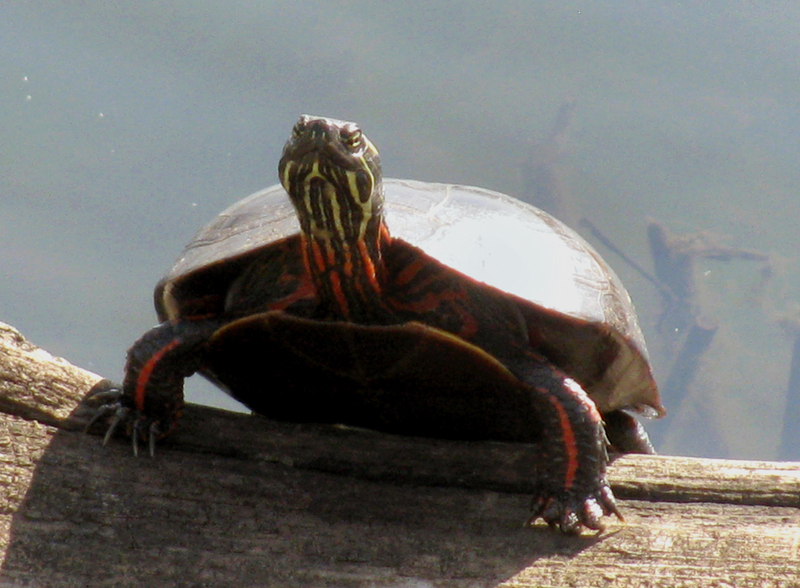 The sunny, spring weather has brought the turtles out from their winter hiding places. I was inspired to go looking for some this morning after seeing lots and lots of turtle photographs published by a fellow blogger. 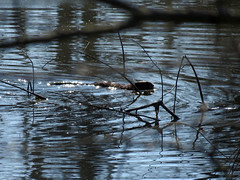 I waited until the sun seemed worthy of turtle-warming rays, then went to a county park to scout for turtles. I found some eastern painted turtles soaking up the sun on a partially submerged tree trunk near the edge of the pond. 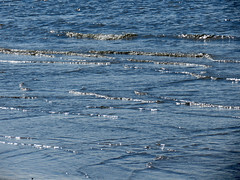 I planned to get closer to them, but they immediately splooshed into the water before I could even try to approach. 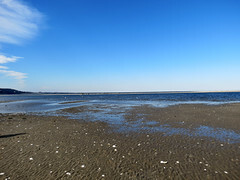 They took turns popping their heads up from the water in various locations as they checked to see if the coast was clear. 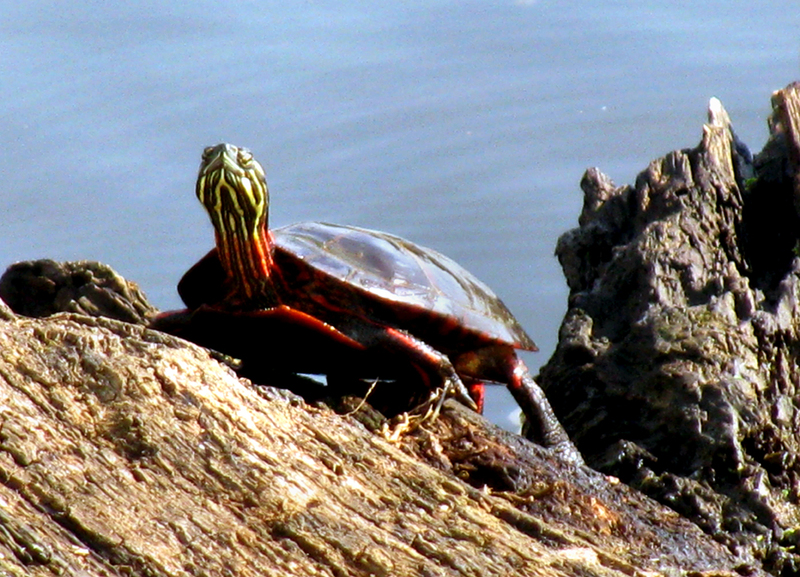 Finally, the boldest turtle swam over to the tree trunk, climbed up, stretched out his head, and returned to his sunning. 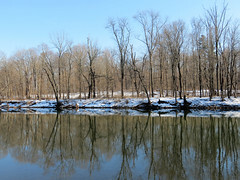 There were at least three or four other turtles who continued their surveillance from the water, with their periscope-like heads randomly popping up to survey the log. 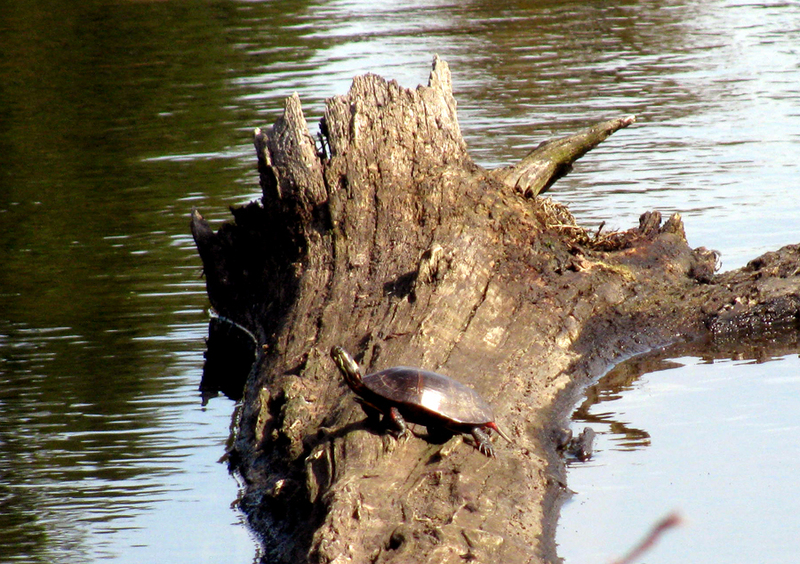 Eventually, another turtle decided it was safe and began slowly approaching the log. He cautiously climbed up the side and then froze for a few moments. After a period of looking around, he finally relaxed his position and lowered his body down onto the log. 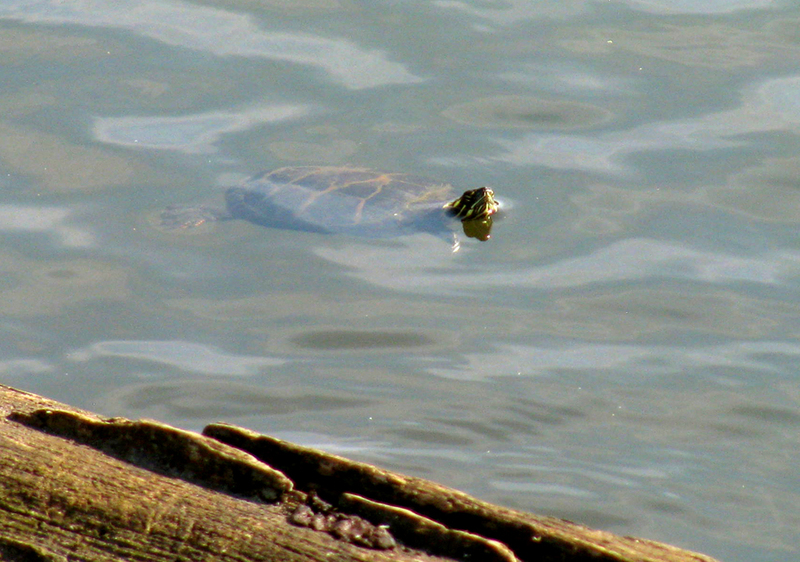 Then the turtle extended his head into just the right angle for soaking in the maximum amount of sun. 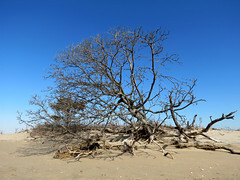 You can't miss this "tree" that towers above all the other trees. Have you ever seen a super-sized tree of unnatural height that looks completely out of place? 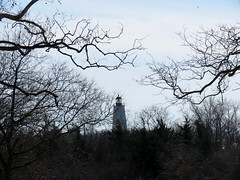 It towers high above all the other trees near it. Although it’s trying to fit in, it sticks out like a sore thumb and calls attention to itself. 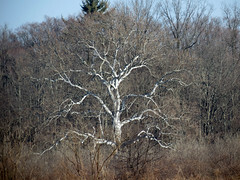 You won’t find this tree in a field guide. 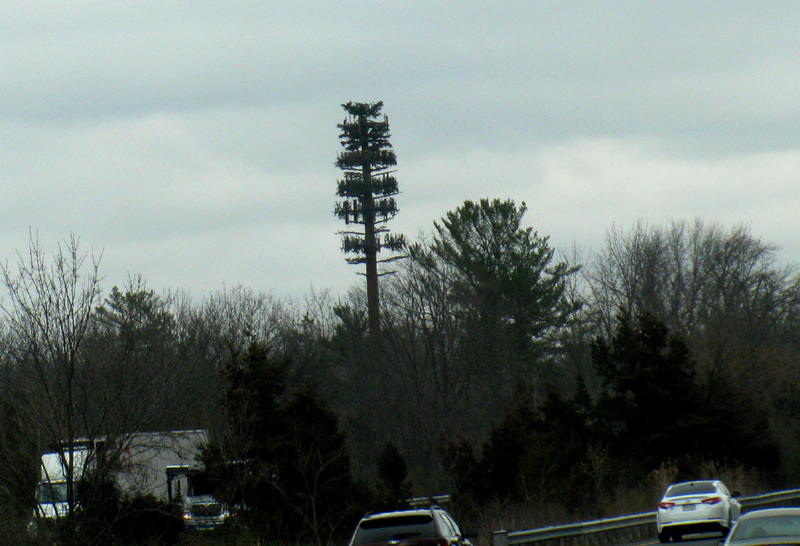 I’m referring to cell phone towers that are masquerading as trees. The first time I saw one of these tree towers, I was dumbfounded. The shape was unnatural and completely disproportionate. The branches were awkwardly positioned. These “trees” are reminiscent of a worn-out, artificial Christmas decoration that should be kept unopened in the corner of someone’s attic. I admire the attempt to blend in a man-made object with the natural surroundings, but I think these pseudo-trees don’t look very real. Who knows though? Maybe the birds like the extra-high vantage point. Nice pattern, but very distracting. 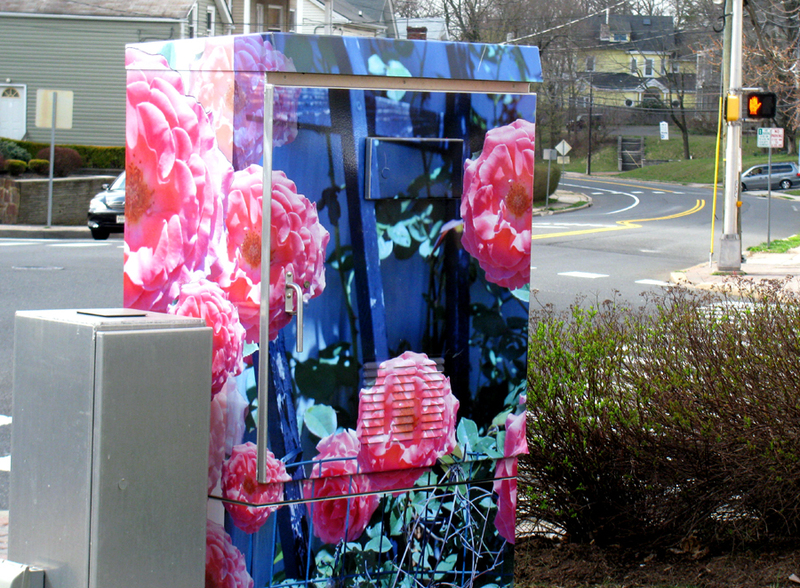 Decorated utility boxes are another man-made object demanding our attention. 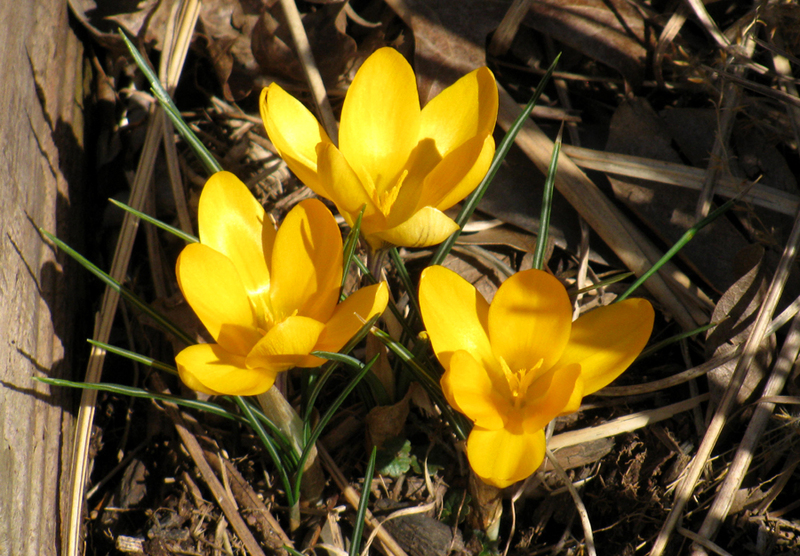 They don’t blend in with the natural environment because they are painted with loud, brightly-colored flowers or other abstract art. 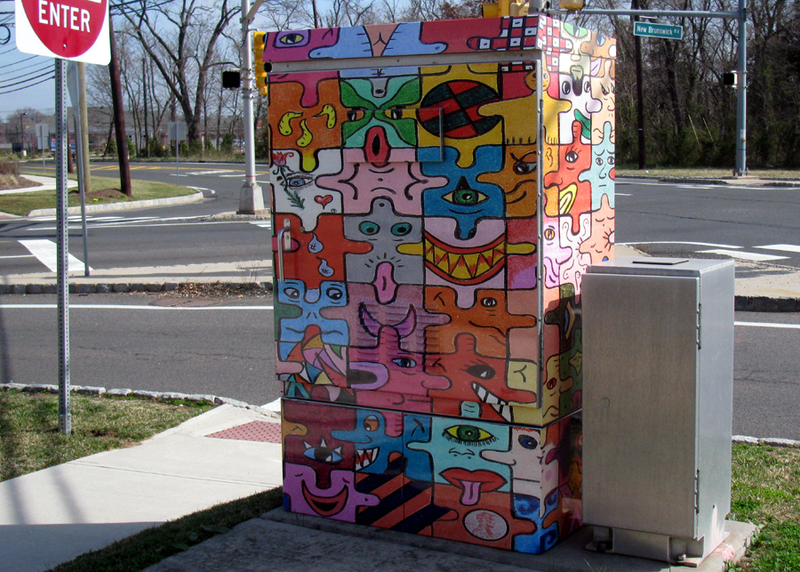 When I’m negotiating a busy intersection, I find it unnerving to see a large, psychedelic-colored ‘tissue box’ out of the corner of my eye. Your brain is forced to try to decipher the meaning of the artwork, instead of observing the traffic signal and watching out for pedestrians. Although they can be pretty, these elaborately painted utility boxes distract me and scream for my attention in Technicolor. If kept their normal shade of silver-gray, they wouldn’t really be noticeable. To be fair, the use of bright colors is probably a deterrent to graffiti and the boxes do give local artists a canvas for expression. 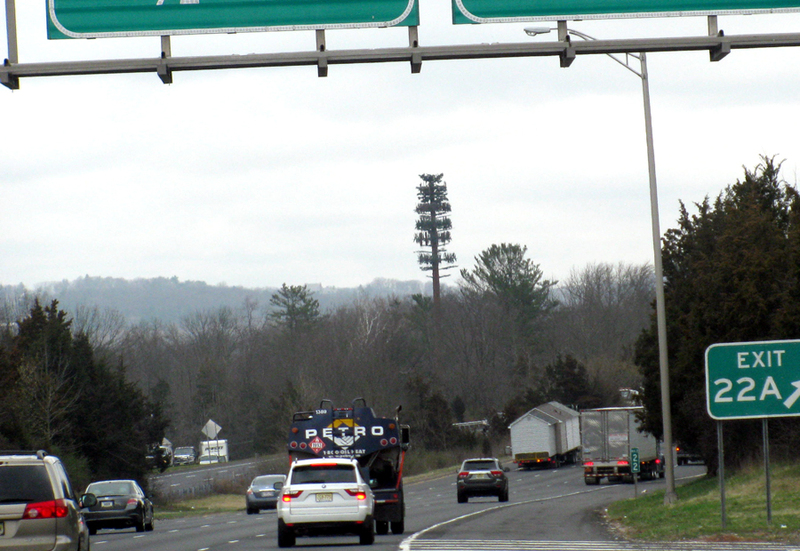 So, what do you think about cell phone towers masquerading as “trees” and larger than life “flowers” on utility boxes? Do these decorated man-made objects do a good job blending into the environment or do they look fake and unnatural to you? 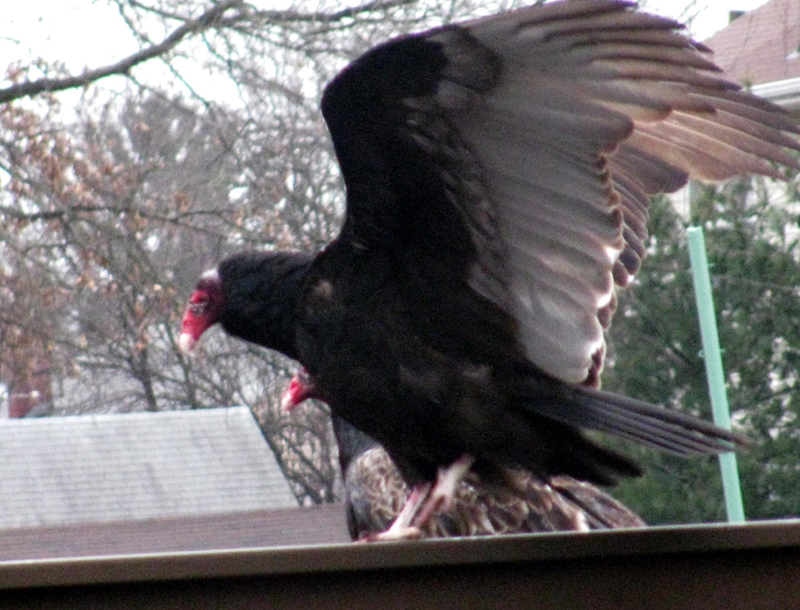 My backyard seemed to transform into a bird haven this morning; it also attracted an unusual avian visitor. The cold weather must have stirred up their desire for feeding, because within a one-hour period, I was able to witness a wonderful variety of birds. 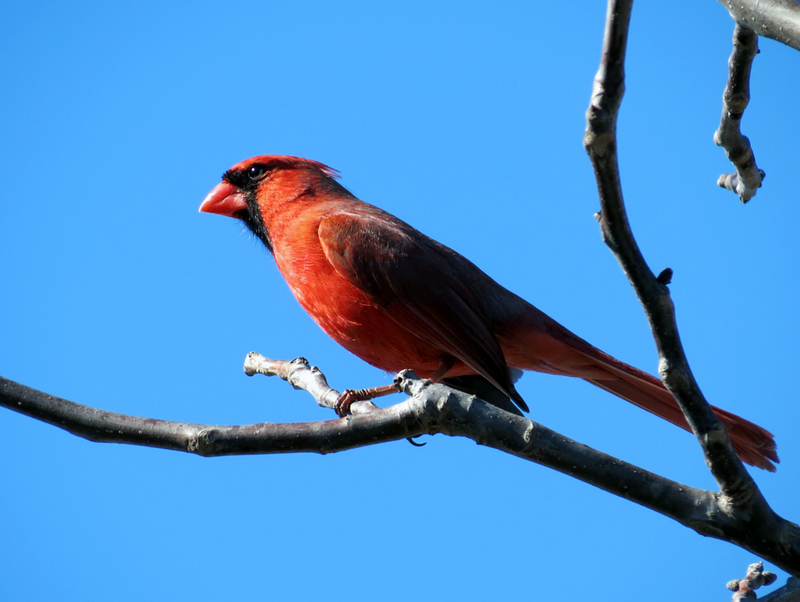 One type of bird would put in an initial appearance, make a curtain call or two, and then exit the backyard stage for the next bird act. I’m pretty sure it started with the red house finches and a few goldfinches who have lost their summer yellow. Then, along came the juncos, tufted titmouse, and sparrows. 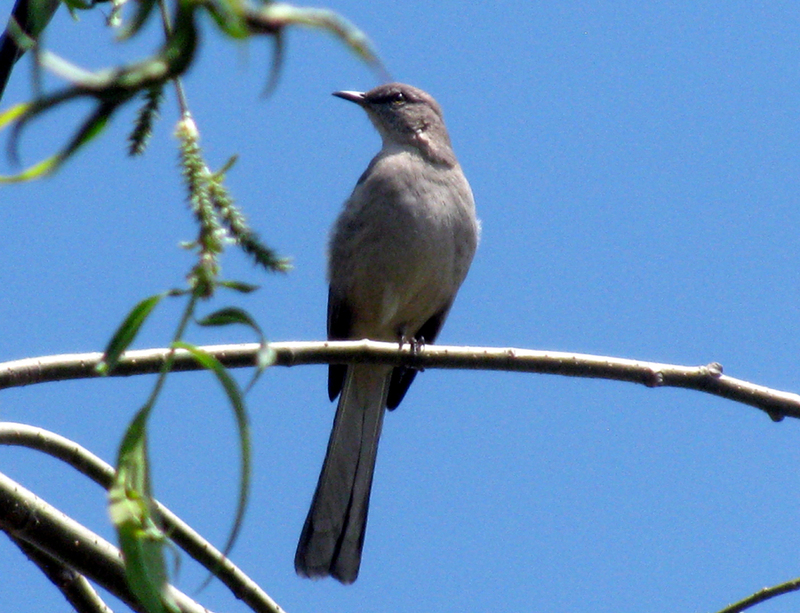 Next, it was the nuthatch and the noisy wren. 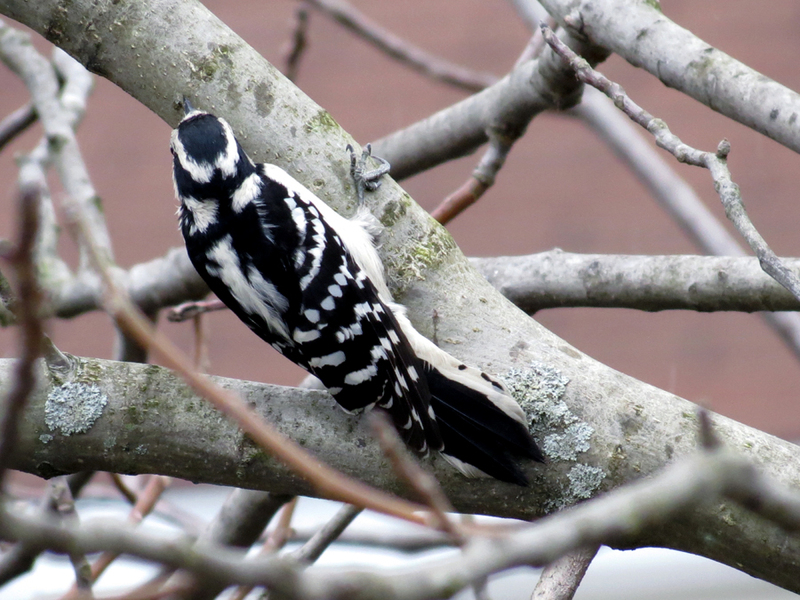 The woodpeckers took over to start the second half-hour of my impromptu bird haven. 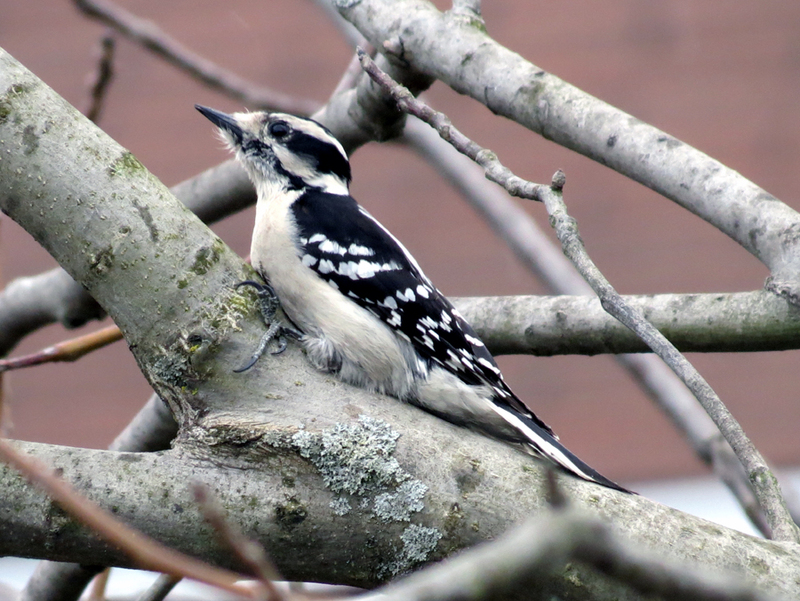 The male and female downy, the flicker, and the red-bellied woodpecker all made a visit. 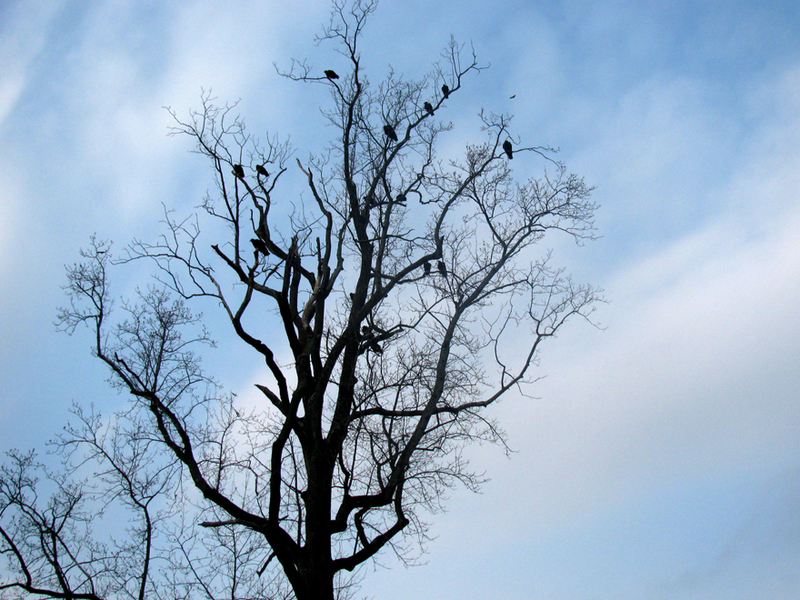 The starlings flocked in and shooed everyone else away, only to be replaced by the blue jays and mourning doves. 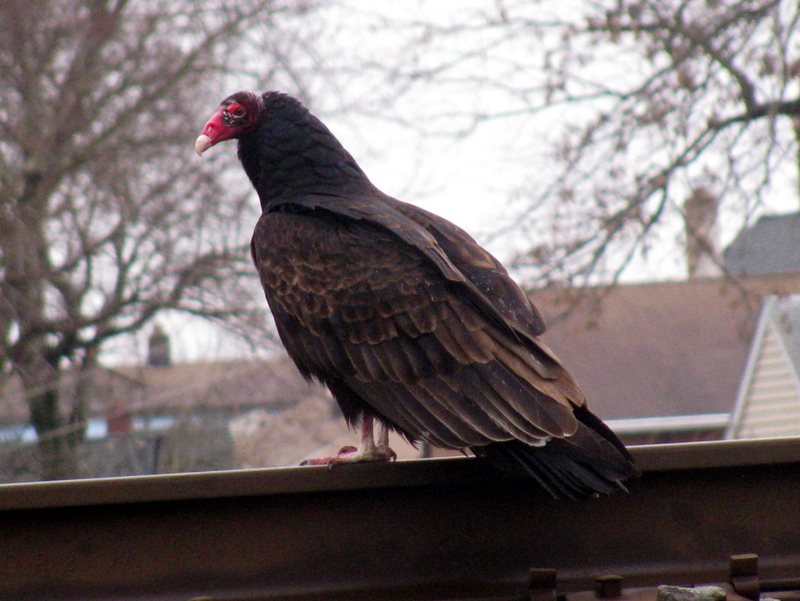 There were crows flying by and one lone turkey vulture circling off to the left. This sounds great for birders, but it’s a problem for me. It’s distracting! Hey birds, I have work to do. Stop your trilling calls and your swooping fly-bys and let me focus on the projects at hand. Instead of kick-starting my day, I’m standing shoeless in my socks on the frosty back porch, with no coat, taking photographs. 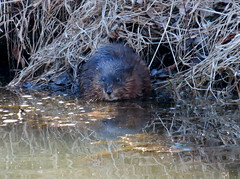 Just when I thought I could get back inside to my work and the warmth, an unusual visitor made an appearance. 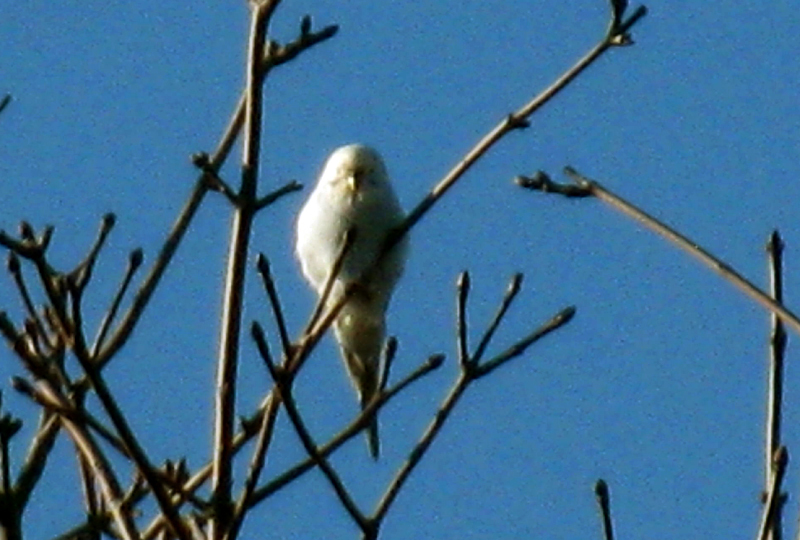 I spotted a flash of white near a small group of finches toward the top of the neighbor’s tree. 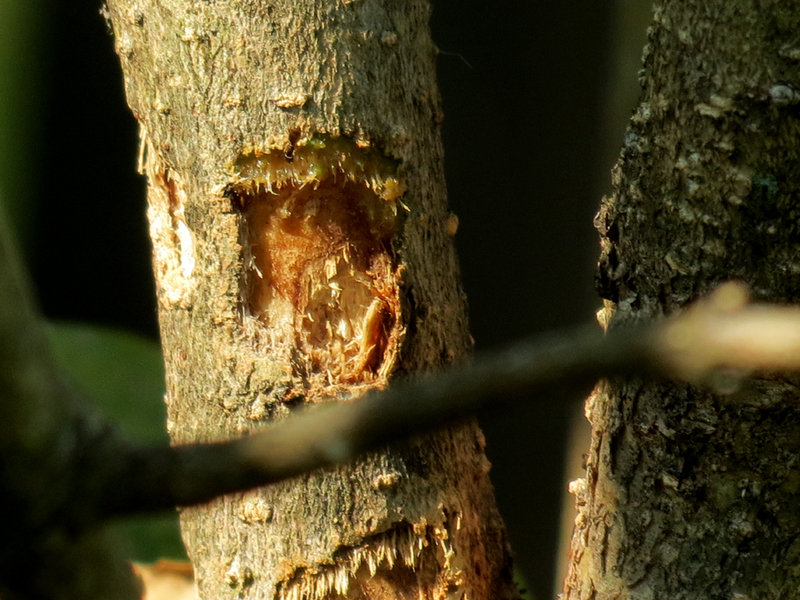 I thought maybe it was the nuthatch again so I walked closer. 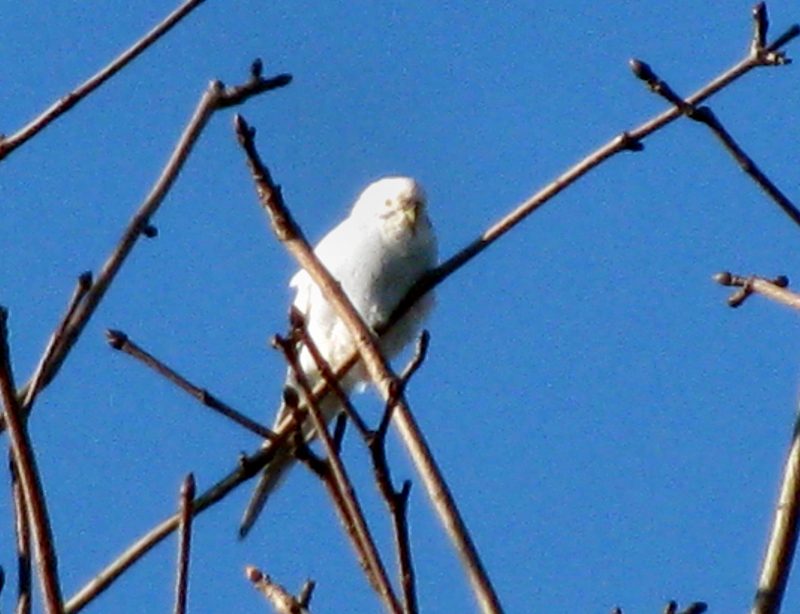 Unbelievingly, the white bird looked like a parakeet! 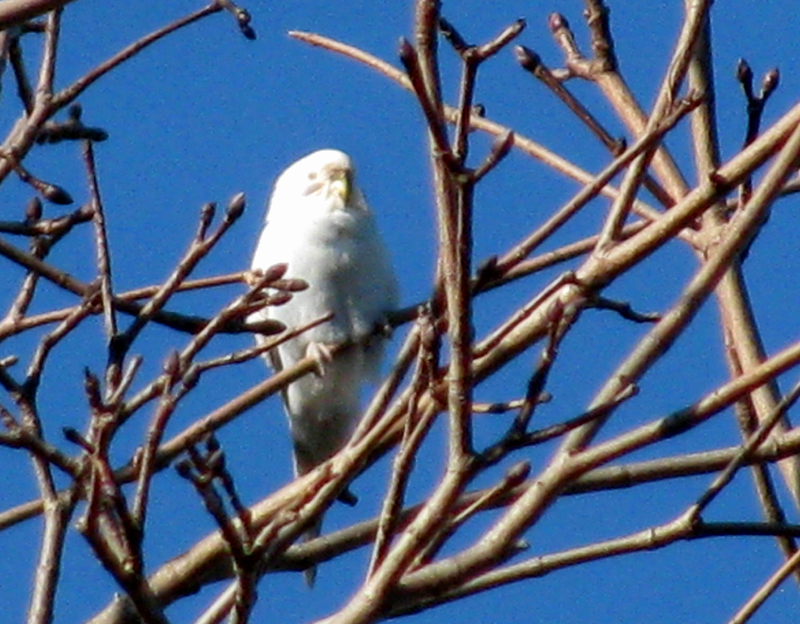 Now I had a serious distraction — was there really a white parakeet flying around outside of my house? 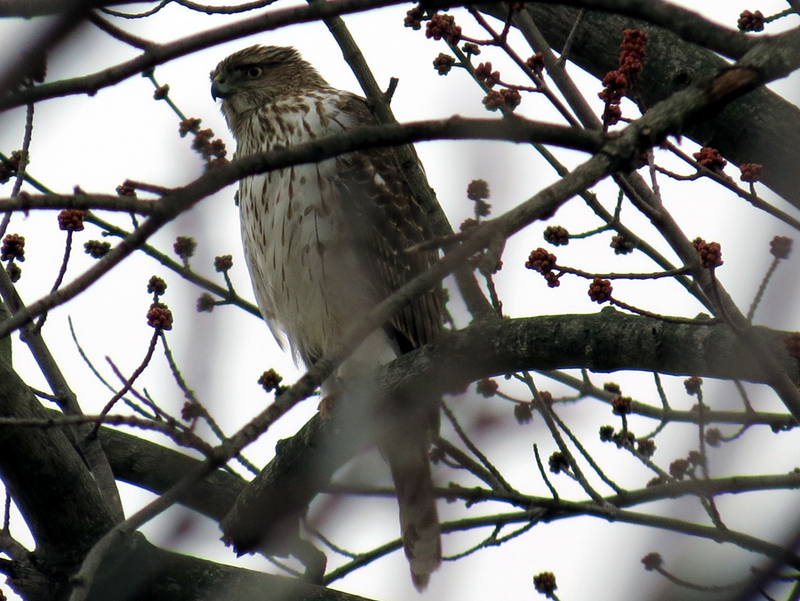 I took a few quick photographs before it flew off with the finches. 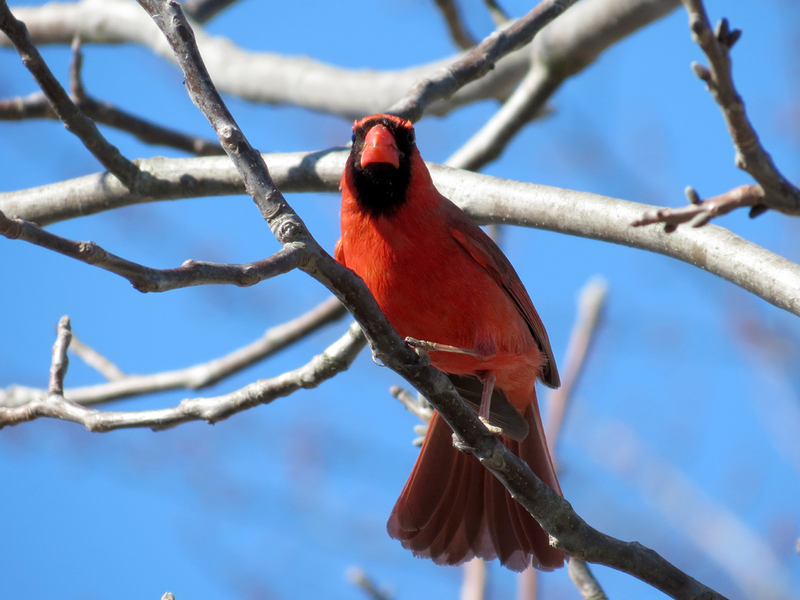 Most of the birds who visited during my one-hour bird haven were frequent visitors. I never expected to see anything unusual. Do you think the white bird was a parakeet? We welcome your comments.